I’ve been craving pipian sauce. For those of you unfamiliar with pipian sauce it’s a spicy, green mole that uses pumpkin seeds or pepitas and tomatillas as its base. 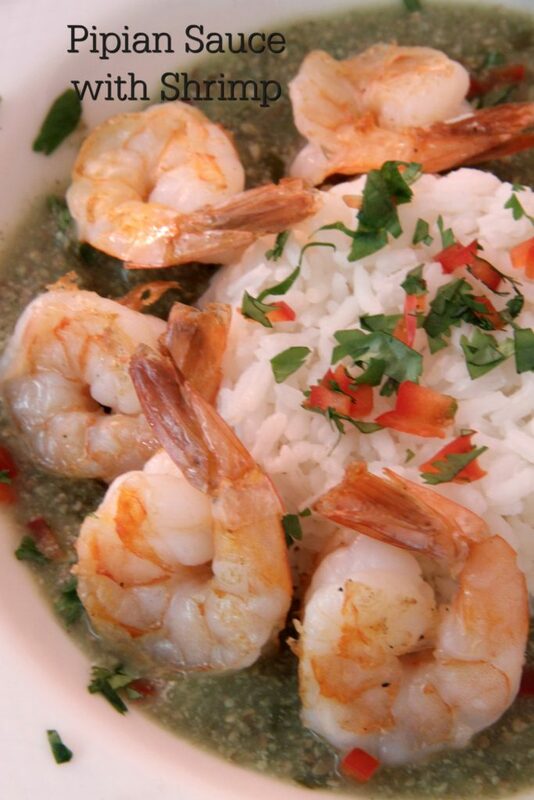 Pipian sauce is wonderfully versatile and goes well with shrimp, chicken or pork…actually just about anything. I learned this simple recipe from my mentor Ramerez while at El Teddy’s in New York. I couldn’t find the scrap of paper that I had scribbled his recipe on but was confident that I knew what I needed. I went looking for some shelled pumpkin seeds. My local Mexican mart only had those small bagged ones. I walked over to my local, overpriced, healthy, hipster mart and there they were in all their glory. But right next to them were sunflower seeds. A major brain fart or, let’s be honest, senior moment brought major doubt: pumpkin or sunflower, pumpkin or sunflower. It’s been at least 15 years, maybe closer to 20 years since you made pipian. Are you sure Jude? This great debate would have continued if I was not rescued by an employee…holding a broom…who spoke Spanish. I asked in my very rudimentary Spanish if the pepitas were pumpkin or sunflower. He reassured me, in perfect English, that pumpkin seeds are what I was looking for. I thanked him and told him that I was going to make pipian sauce. He looked puzzled and said, “But you’re white. You know how to make pipian?” We then had a short chat about moles he loved and that I worked in a Mexican restaurant in NYC that made really great moles. He and I left with a bit of new knowledge: People don’t always fit the stereotype they represent. So here it is pipian sauce from back in the day. It’s so easy and out of this world tasty. Heat a medium sized saute pan, add pepitas and toast. You'll hear the seeds pop. Don't let them get too dark. Remove from heat and cool. 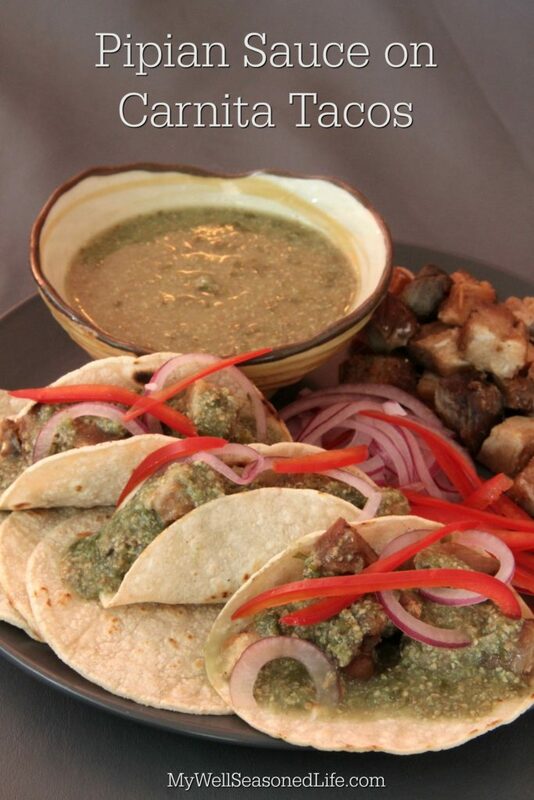 Add tomatillos, onion, garlic, chicken stock, cilantro and serrano peppers into a medium sized sauce pan. Bring to a boil and simmer. Once the seeds are cooled, place in bowl of food processor and pulse until a fine meal. Don't make a paste out of the seeds. Add seeds to the vegetables and cook for ten more minutes. Blend sauce with immersion blender until vegetables are pureed. Add salt and pepper. Mmmmm, If I knew what tomatillos are, I’d be making it already. The nation of Slovenians makes oil out of pumpkin seeds. It’s not good for anything but salads, but once you get hooked, there is no salad without it. I’ve never heard of Pepian sauce before, but it sounds like a must try. Funny story, Greg. And this sauce sounds divine. This is a new sauce for me and it sounds delicious. Finding pepitas in the valley is pretty easy.